These days there are countless interior styles, ideas and décor options. Fusion interior design, just like fusion cuisine, is a creative way to incorporate an eclectic mix of two of more models, and generate a cohesive and innovative concept. A composite of chosen elements and theories, fusion style is boundless in its ability to produce inspired original ideas and schemes. Firstly, there are no rules—part of creating a new design is to play around with existing interior guidelines, and break the practice to see what works and what doesn’t. Think contrasting patterns, eras, traditions, and textures. Perhaps you would like to fuse a modern and minimalist interior with a traditional set of furniture? Or maybe tribal elements blended with smooth, sleek interior décor? Fusion style is an easy way to work with your existing interior pieces and mix-and-match to create something unique and unusual. Gain a few pointers from the following examples below, and redecorate your home in an individual and distinctive way. When blending different trends with each other it can often be difficult to know what to include and what to emit. This is an excellent example of many different styles which have all come together and created a busy yet harmonic space. Illustrated here are numerous art deco pieces, from the Man Men-esque drinks trolley, to the bold wall mirror. Along with those examples, there are plenty of other mid-century pieces too; the stylish desk chair is wonderfully matched with a contemporary desk, and set upon a classic antique Persian rug. 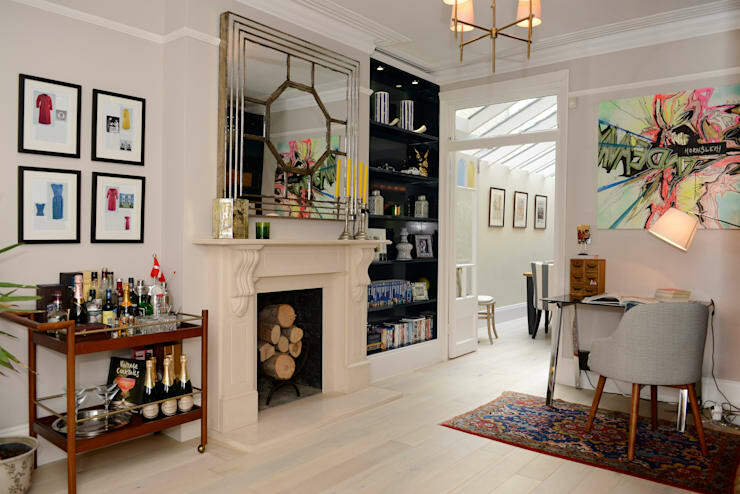 Furthermore, we see contemporary art upon the walls, which is juxtaposed exquisitely against the traditional architecture of the home, and the classic central mantelpiece. 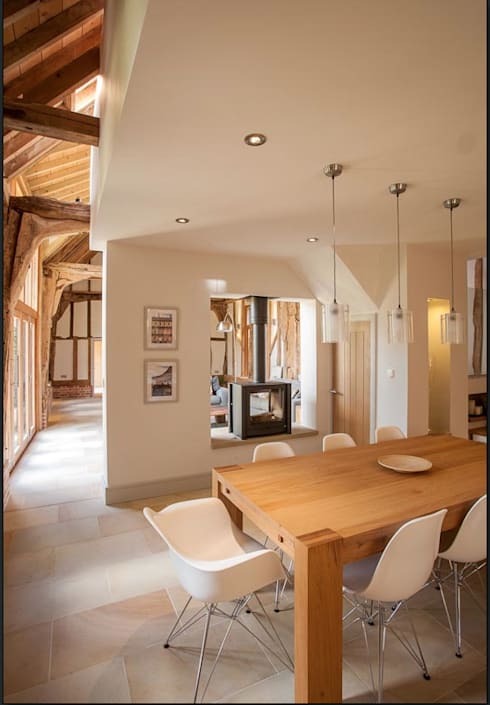 Within this barn conversion from Beech Architects, we can see how the designers have blended and differentiated rustic architecture with piece of contemporary furniture. In stark contrast to the vaulted exposed timber beam ceiling, this space also has modern walls and partitions which help to compartmentalise the space and ensure it feels cohesive and liveable. The iconic mid-century dining chairs are again a wonderful juxtaposition against the country charm of the raw timber table, and surrounding décor. This room from Flower Michelin just screams style and chic design nous. From the mirror that has been leant against the wall, to the miscellaneous artwork rested atop it, this space oozes individuality and intrigue. The styles that have been combined here are elements of industrial furniture, such as the use of iron table stand, and blended with traditional pieces that have been repurposed or reconditioned to suit the eclectic aesthetic. Think mismatched chairs, sisal rugs, repainted heritage mirrors, and a few retro accessories. 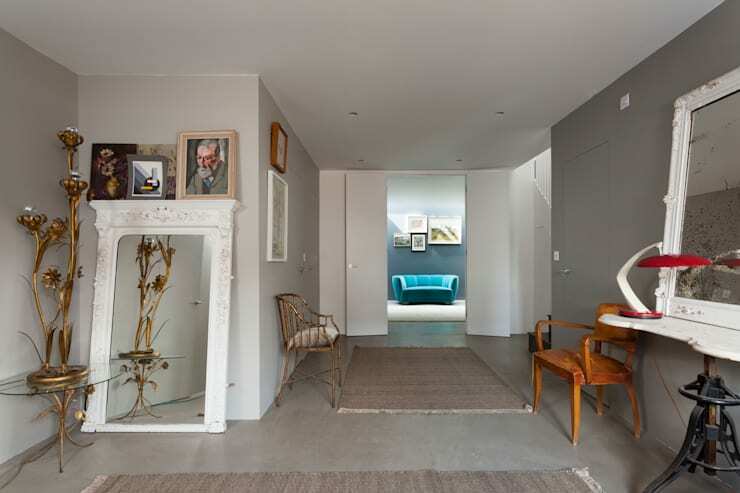 At first glance this space looks fairly simple and unobtrusive, but upon closer inspection it can be seen that it is more than a simple entry hall. This exciting space manages to include a hint of contemporary cool, a dash of classicism, and a touch of rustic tradition to create a space that is interesting and cohesive. From the floor-standing art, to the statue adjacent, the entry is fascinating and stimulating. 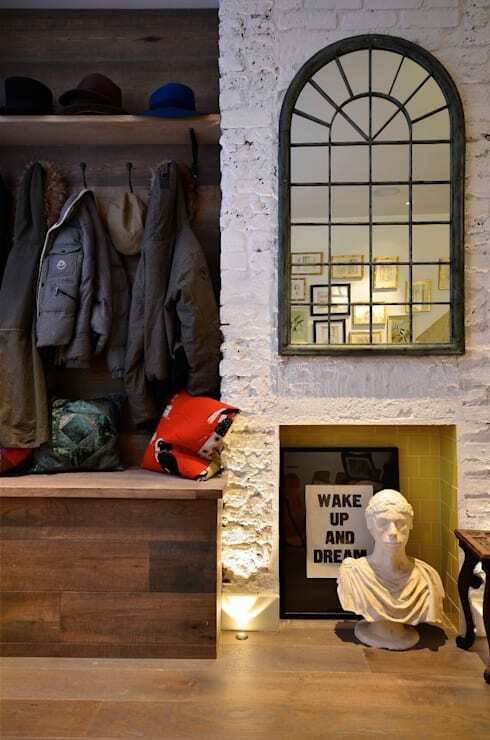 Built in joinery keeps the coats, bags and other accoutrements at bay, while the floor lighting highlights the rugged painted brick wall and antique mirror above. This is a simple yet lovely bedroom—traditional country furniture sets the scene for a space that oozes comfort and homeliness. In addition to the warmth and contented ambience, the space also employs some modern touches to increase its usability and style. 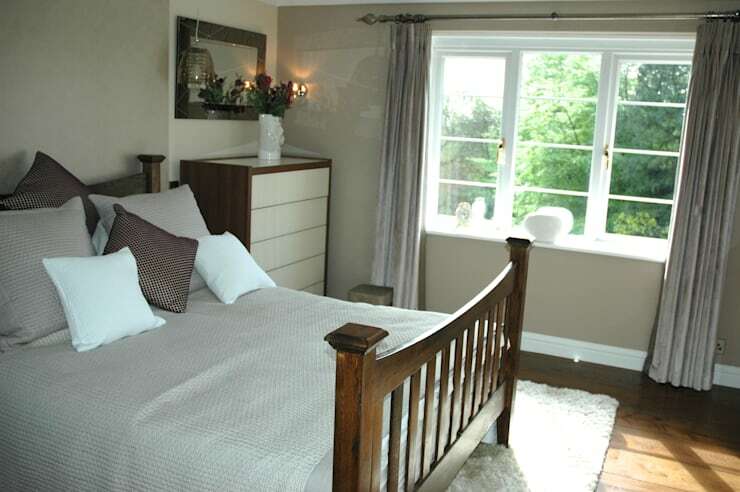 The tall-boy next to the bed is an excellently modern and linear, and surprisingly blends extremely well with the traditional bed. Think contemporary pieces of furniture mixed with plenty of country style, a neutral yet modern colour palette, and white shag rug to complete this tasteful look.